Do horses remember each other? How will they react? 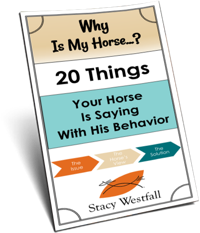 How much do horses remember each other? Will Presto and Justice pick up where they left off? Did they miss each other? 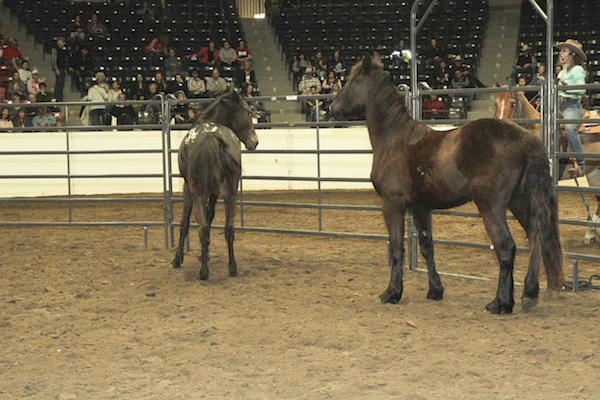 These were some of the questions I wanted to answer at the April Equine Affaire in Columbus, Ohio. 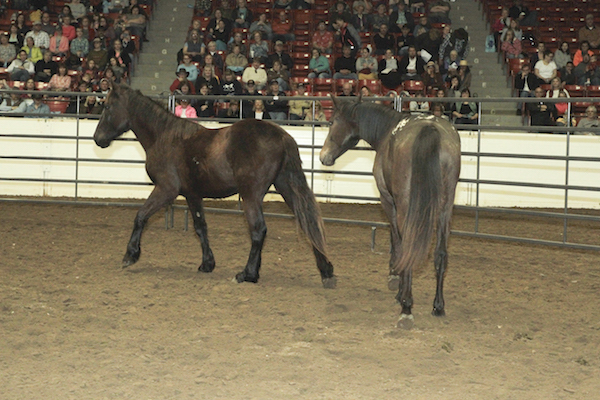 As a reminder, I adopted both Presto and Justice from Last Chance Corral when they were very young. You can read more about the beginning in the earlier blogs and videos I will link to at the end. Presto and Justice spent the first six months of their lives together. My plan from the beginning was to adopt Presto. When I contacted Last Chance Corral they said that Presto was too young and weak to be adopted alone. After discussing things my husband and I decided that we would adopt two with the plan of rehoming the second one after weaning time. The day we went to pick up Presto we kept an open mind about who the second one would be. Justice was a strong, confident colt that was very healthy. Pretty much the opposite of tiny frail Presto. My husband also teaches at Asbury University where they train police colts. In an attempt to stay one step removed from the process I asked Jesse to pick the second colt. He picked Justice with the idea that he might fit into the police colt training program at Asbury. Six months later, Justice was adopted by Ausbury and he and Presto were officially separated. 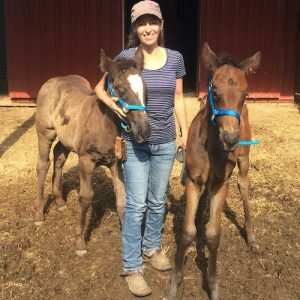 I had done a lot of work before this day by mixing the other horses they were turned out with and separating them at different times. When the ‘big day’ arrived and Jesse drove out of the driveway with Justice, it was just another day. No noise. No commotion. That was November 2016. Almost a year and a half later…what would they do when they saw each other again? Would they eagerly greet each other? Would they act like old buds or new horses meeting for the first time? Let’s go through what happened and my take on it now that I watched it. 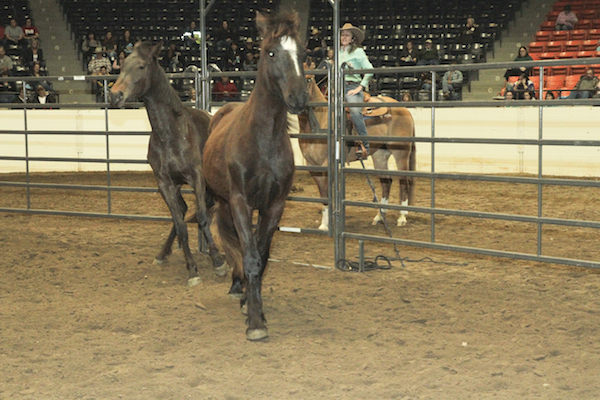 At the beginning of this demo I showed Presto interacting with Newt, the horse I ponied him in on, and Willow, a mare that Presto hangs out with. I also showed some of the groundwork training that Presto has. All of this was done to allow Presto to acclimate to the Coliseum as well as to establish Presto’s natural pecking order and general demeanor. I have been watching Presto for close to his entire life and I use all of my knowledge to interpret what was going on. seven were clearly above him in the pecking order. two small mares he figured out he could ‘plow through’ so it was more of a toss-up on the order. 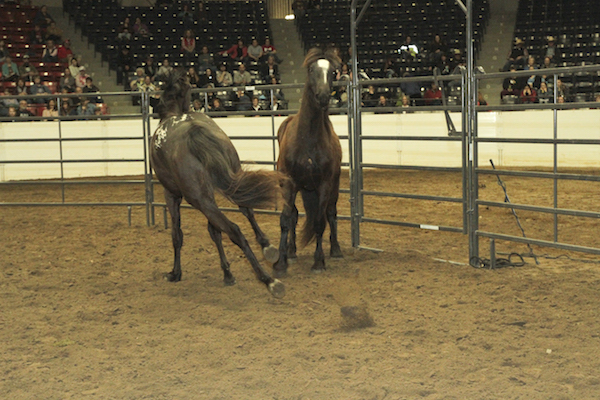 Presto thought he was gaining the upper hand but I separated them because the mares were kicking harder as time went on. I was concerned about someone getting hurt and it was a toss-up if it would be Presto from kicking or the mares from being run over. 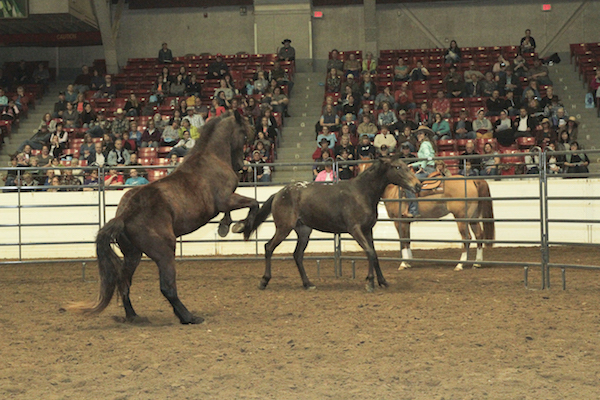 one horse is pretty equally matched and they play/fight. These two are really interesting to watch as they have not yet decided who is above whom and the go-between play and fight. The older they get the more serious the jabs are becoming-someday the order will be decided. When Presto and Justice were first turned loose Justice took off trotting. He had not been in the Coliseum and I believe he was checking out his surroundings. He happened to head vaguely in the direction of Presto who appeared alarmed and trotted away looking over his shoulder. As Justice wasn’t actually chasing him, Justice turned away to check out the crowd which confused Presto. Presto was clearly trying to figure out what Justice was up to. In photo 2 Justice stopped by the gate that he was brought in and Presto walked up to check him out. You can read that both are ready to move but neither is alarmed. 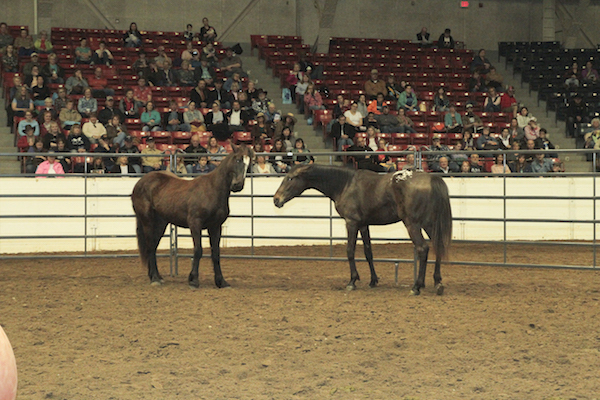 In photo 3 you can see that they are doing a fairly traditional new horse meeting. You can also see a little more movement in Presto. In photo 4 you can see that Presto decides that he is going to take charge. For everyone who was watching this was interesting because we had seen him either playful or submissive with other horses up till now. When Justice first entered, Presto clearly seemed hesitant or concerned but not aggressive. Here you can see that he is clearly sending Justice signals. Justice is interesting to observe because he looks a bit surprised. In photo 5 you can see that Presto has moved quite a bit and that Justice is leaving. It is also important to note that Justice still has a slightly surprised look and if you go back to photo 4 you can see that Justice has pretty much just turned around, he really hasn’t gone that far. Presto, on the other hand, has made a pretty big move…but look at Presto’s face and movement. They both have a slightly surprised look and he has followed his big move by leaving. As this progresses it becomes more clear that Presto is ‘bluffing’ by making very big animated moves with very little actual contact or willingness to back it up. Photo six makes it more clear that there isn’t a clear leader here. 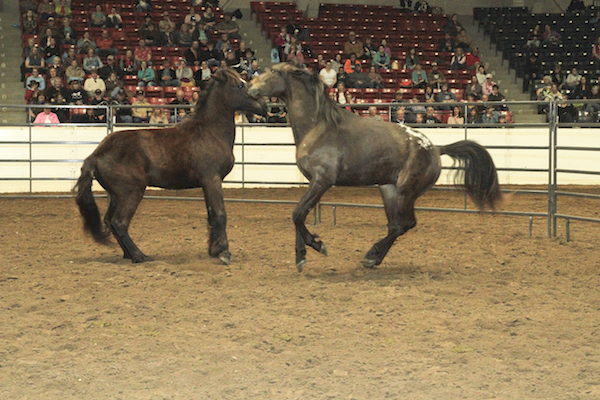 Both horses are willing to engage each other in play fighting or big threating moves with little follow through. This is more typical of what Presto does with the one friend he has where they haven’t determined the pecking order. Presto does get in a ‘sucker punch’ on the way by at one point. I call it a sucker punch because he was running past and reached out and ‘tagged’ Justice which is nowhere near as dominant a move as holding one’s ground or moving the other horse. Photo 8 shows more of this posturing behavior. While it is easy to think they made contact with each other they were actually bouncing around without touching. When Presto is with his ‘friend’ at home that he is trying to figure out pecking order with they are in actual contact most of the time. This means that they actually push each other off balance, nip, bite, and kick. Here we still see this two ‘ threatening’ to do something but without follow through. Photo 9 they are slowing things down a bit. The two different expressions clearly show that neither wants to be perceived as backing down. Photo 10 shows Presto running past Justice again trying to move his feet. Rather than move Justice has reared, which actually plants his feet. Still, no one is giving in. Photo 11 shows that Justice has a talent for standing on his hind legs. 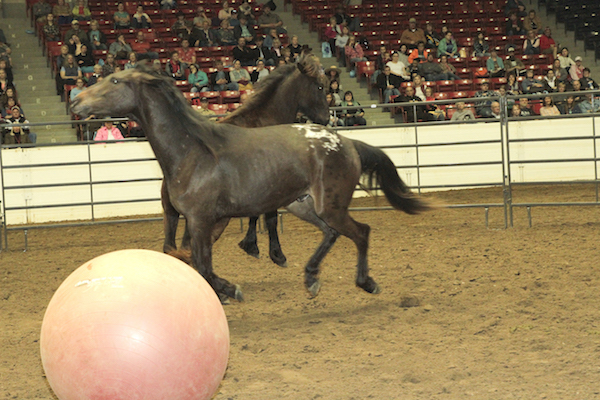 He strikes the ‘Breyer horse rearing’ pose quite often. Although we don’t know the breeding on either one, Justice is clearly more draft than Presto. Their style of interaction also shows what they prefer. Presto did a lot more moving, charging, and quick changes of direction. Justice did more holding his ground. As a trainer evaluating them this is interesting to see because Justice is supposed to be a police horse, which will be required to hold his ground during riot training and crowd control. I would like Presto to try dressage after receiving a solid education as a trail horse. Dressage will require more movement and agility. 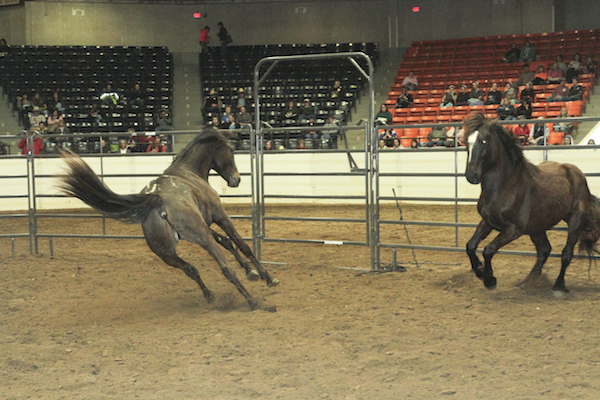 Both horses are displaying traits that could work well in their chosen paths. Photo 12- I’ve never seen Presto work this hard before. He is showing more athletic moves and energy then he lets on to containing most of the time. I call this ‘accidentally confessing’ to their natural skills. Notice again that Justice is displaying impressive balance over the haunches. 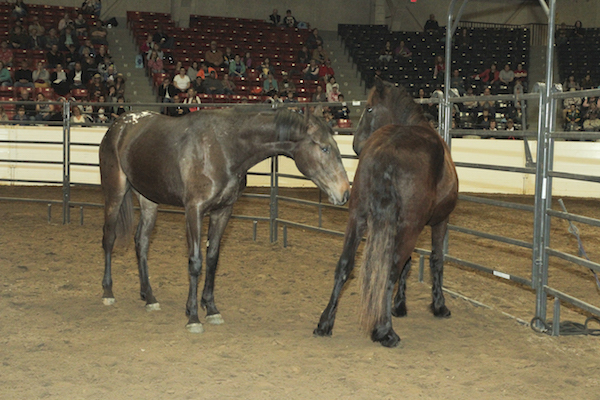 Photo 13- Both horses were getting tired and spending more time away from each other. I decided to call it done and walked into the pen. 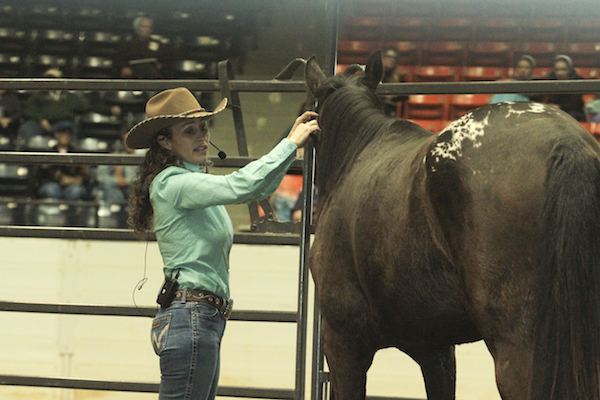 It is interesting to note that I was comfortable walking in because both horses know to respect my space. Wow, look how BIG Presto is now that you see him near me. Compare this to the first photo at the top of this blog! Photo 14- Justice is happy to see his student trainer from Asbury, Lacey. It is interesting to note that Justice never got worked up about the environment. Again, this is another great sign for his future employment as a police horse. My conclusion at the end of it all is that, yes, they do remember each other. Did I wish for a ‘happy reunion’? Yes. Although this one proves to be more interesting to study. 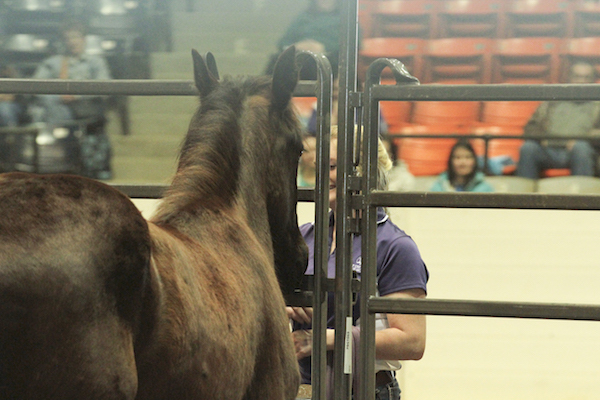 First, it is interesting because it proves that these two horses were raised together and yet weaned in a way that they have no long-term issues with the separation. 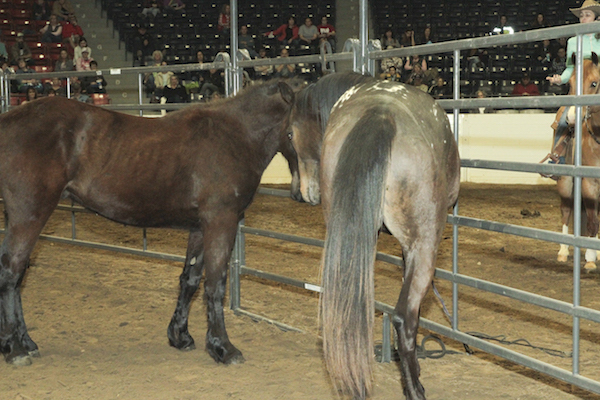 Sometimes it is easy to think that the horses must be missing each other. This clearly proves that this was not the case. Now to why I think they remember and why I think they reacted the way they did. Based on the way they reacted I think they remember each other. Presto is generally much more reserved around new horses because he has yet to become the ‘lead’ over anyone…. That’s right. The last month or so before they were separated Presto began moving Justice around. For the first few months Presto was very scrawny and Justice easily moved him around. It is interesting to note though that Justice didn’t ‘move’ Presto as much as Justice just didn’t move. If Justice wanted to eat, or drink or move he did and Presto had to fit in around it. This is different than Justice moving Presto. Presto just happened to be smaller and didn’t try moving Justice. In the last couple of months, Presto became more active. 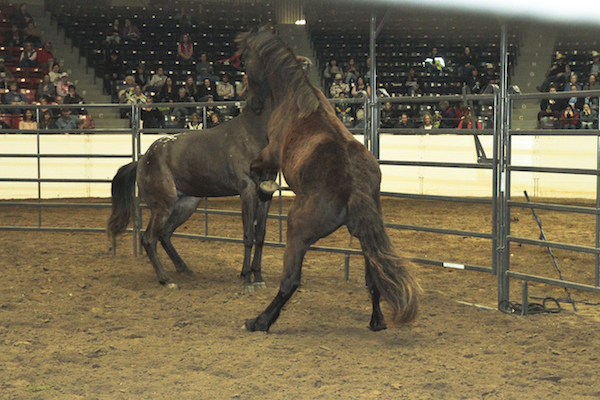 He was feeling better, getting stronger, and is naturally a horse with more movement than Justice. Presto began by pushing Justice out of the feed and then kept testing things. Justice would leave simply because it was easier to eat out of the second bucket…but Presto really thought he had some power now! It never really became anything more before they were seperated. Presto was a leader by default, simply because Justice didn’t care. Presto has been testing the bounds with all of the horses but he hasn’t really become secure in himself yet or dominant over any other horse. I think he remembered his position with Justice and was ready to see if it was still there. Justice has been living in a field full of other draft type horses that are fully grown. While Presto has discovered he can move some of our smaller horses, Justice has most likely been kept in check by the larger horses. Plus Justice has been pretty laid back the whole time. Overall the demo was very enjoyable and educational. I’m sure they will meet again down the road but for now they seem perfectly content not hanging out together. 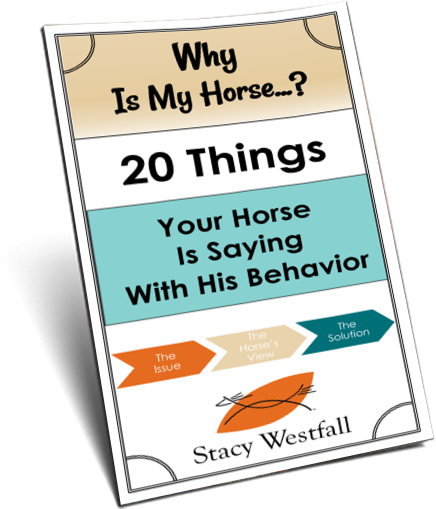 I LOVE equine communication!! Thank you for sharing! Yes. They remember. I took a mare back to the farm I bought her from and one of her grown daughters ran to the end of the pasture screaming when the trailer turned into their driveway. She had never seen the trailer before so she must have heard her mom. They huffed and puffed at each other for a long while. Adorable.